Perhaps I imagine too much back story, but to me there’s something intrinsically sad about going to auctions. An auction at the Hotel des Ventes is not as bad as one in situ, as there is usually a variety of sources and reasons for the items coming up for sale, with the addition that you are in a neutral place. Going to a house is another matter. I have been to 2 house auctions so far. One was in a gite, the owners of which were getting divorced – sad, yes, but not immensely, as the place was furnished for business reasons. The other was at a former Chambres d’Hôtes and home. Only when I was there was I advised that it was an auction enforced by the court and that someone was still living there. This was really sad. The people had obviously become bankrupt and some of their family rooms were mixed with the chambres d’hôtes area, so, as everybody looked around, the son who still lived there was in his room. He’d locked himself in to stop people snooping around there, but would have heard everyone traipsing up and down outside his room for a few hours, making comments about the contents, and be unable to come out. It seemed only lockable from the inside, no place on the outside to turn a key and disappear for a while, so perhaps that was why he remained. Unfortunately, most of the items weren’t in great condition or of a style I wanted. I left before they got to the end of the auction. Leaving the premises I saw that many people had the same thoughts as there were half the cars parked along the road as at the start. The people attending were quite mixed. Some seemed to have some respect for the situation and others seemed more grasping and vulture-like. It’s also extremely sad when you can see that the people have died and all their possessions are up for sale – no family either to take them or interested in them – but you can make your own images in your mind about what sort of people owned them and the lives that they lived. One set of photos advising a house sale appeared to be of a younger person’s possessions, with all the clean and modern tools of his trade up for auction. I immediately thought perhaps he had died, although it was possibly court ordered too. At the auction rooms, it can be a lighter affair due to the different reasons for the items being there and the detachment from the owner. These auctions tend to be very long, especially if they’ve got lots of small paraphernalia to auction off, and can be highly boring. The lots at my nearest auction didn’t seem to go in any specific order and I did wonder if they kept back one or two more interesting items until the very end to ensure people stayed. But I found the auction rooms a great place for people watching. Much of the buying audience were re-sellers, knowing each other well, kissing each other on the cheek. Some talking loudly with their friends/colleagues about how much they expected to earn from item they’d bought. I felt that they probably did earn their commissions/mark-ups for the time they’re prepared to spend at these things. Others brought their children, as a family outing or perhaps to get them interested from an early age. One couple, both of them smartly dressed in black outfits and wearing diamante-encrusted, tinted glasses, sat apart from the everyone else, on a sofa, and there were no friendly recognitions between them and the rest of the attendees. A lady in her 60s or 70s, pulled a chair out from the rows to sit in the alleyway and appeared to know many people there. Although later I reappraised my opinion as it seemed she just liked chatting to anyone and absolutely everyone, even if that wasn’t reciprocated. She’d brought her own refreshments and tucked in to them when things were getting a little dull for her, and she received a phone call on her mobile while she was bidding for an item – it wasn’t someone that she was bidding on behalf of, it was just a friend, with whom she continued her conversation at normal voice level, whilst continuing to bid. The auctioneer must have seen everything before as he just carried on, almost as normal. There was something about the whole throng that I couldn’t help but wonder if this was what it was like when they used to have public guillotining. Several items under the hammer generated little interest and went for hardly any money. The auctioneer gamely did his best to get people bidding though. One such item was a porcelain pipe. Come on ladies and gentlemen, he implored, ‘seulement huit euros la pipe!’ Giggles rippled along the rows of traders. Each auction house’s page will tell you their usual commissions and the taxes that will apply on top of each item bought. What an intriguing world to have a peek into! Thanks for sharing this part of the “secondhand shopping” world. I think your comparison to the public guillotining is deeply interesting and probably very accurate. 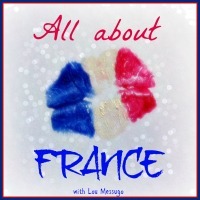 Great post with #AllAboutFrance! Yeah, those quatre-vingt…. are tricky. But it gets better again after you hit 100, so you could wait till the bids get really high! I can totally see how there would be great people-watching at an auction. I’ve never been to a real auction before, but think it would be fascinating. I have never thought about going to an auction in France and I am not sure I’d be happy poking round some-one’s house knowing their contents are soon to be sold to strangers. Yes, very sad. Popping by very late from #AllAbout France!